It turns any room into a nightclub when Maskell brings out the big lighting rig, demonstrated here just before the doors opened at Big Night DC, hosted by HiBall Events every year at the enormous Gaylord National Harbor. 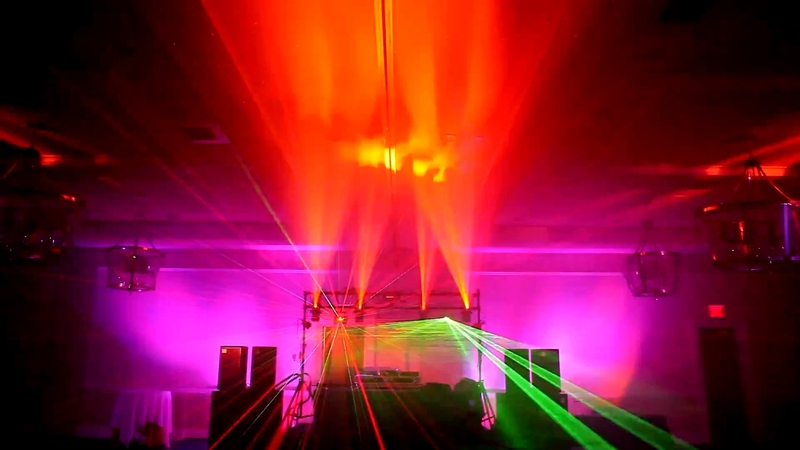 Maskell’s lighting rig is fully DMX controlled and is custom-programmed to complement and enhance the club experience. To further emphasize the beat, Maskell the audio step trigger on the lighting control boards to maximize the impact of every hit with a change of the lights. The system also heavily uses wireless DMX to minimize cord runs. When the party starts later in the night, Maskell jumps on the turntables and devastates the dancefloor while also running the lights to obliterate the already inebriated partygoers. A regular sight on the decks in nightclubs all over Washington DC, Maskell is a seasoned nightlife professional that brings the noise and partying to both clubs and private events alike. I get all of my equipment from Randy White at Chuck Levin’s Washington Music Center in Maryland. http://www.chucklevins.com. This entry was posted in DC Nightlife, DJed by Maskell, Videos and tagged DC DJs, DC Wedding DJs, dj lighting show, DJ Maskell, djs in washington dc, featured, mobile dj, mobile dj dc, mobile dj lights, washington dc djs, Wedding DJs in DC by Mark Maskell. Bookmark the permalink.